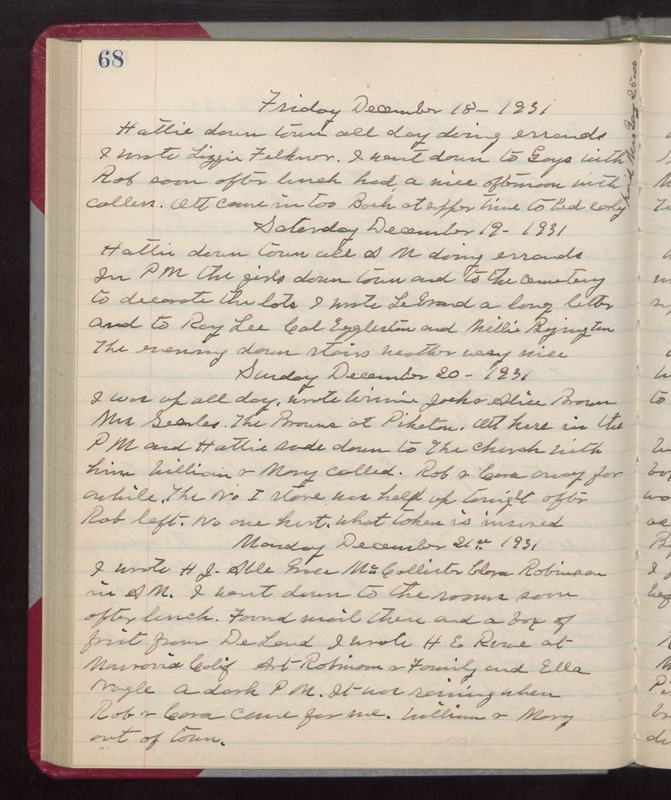 Friday December 18- 1931 Hattie down town all day doing errands I wrote Lizzie Felkner. I went down to Gays with Rob soon after lunch had a nice afternoon with callers. Ott came in too Back at supper time to bed early paid Mrs Gay 25.00. Saturday December 19- 1931 Hattie down town all AM doing errands In PM the girls down town and to the cemetery to decorate the lots I wrote LeGrand a long letter and to Ray Lee Cal Eggleston and Millie Byington The evening down stairs Weather very nice Sunday December 20- 1931 I was up all day. Wrote Winnie Jack & Alice Brown Mrs Searles. The Browns at Piketon. Ott here in the PM and Hattie rode down to The Church with him. William & Mary called. Rob & Cora away for awhile. The No I store was held up tonight after Rob left. No one hurt. What taken is insured Monday December 21st 1931 I wrote H J. Able Grace McCallister Clara Robinson in AM. I went down to the rooms soon after lunch. Found mail there and a box of fruit from DeLand I wrote H E Rowe at Monrovia Calif Art Robinson & Family and Ella Nagle A dark PM. It was raining when Rob & Cora came for me. William & Mary out of town.